Get the tools you need to get the facts and get involved in the fight. 1. Download the slideshow and get the facts, all in one place. Spread a message with ease by presenting and sharing Al Gore’s Truth in 10, a slideshow of the Climate Reality Project. Learn why we must change, how we can change, and if we can do it. 2. 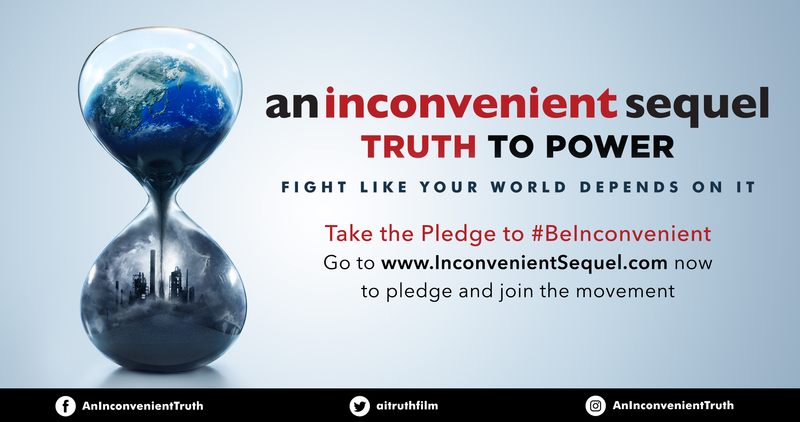 Take the pledge to #beinconvenient. Its time to take a stand by joining the movement to make the switch to renewable energy, urge others to pursue climate solutions, and demand leaders take climate action. 3. Catch An Inconvenient Sequel: Truth to Power in select theaters on July 28th and watch the phenomena go nationwide on August 4th. Ten years after the release of An Inconvenient Truth, the follow up shows just how close we really are to a revolution.